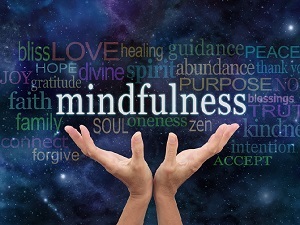 Mindfulness can provide almost immediate benefits in your life and mental wellbeing. Take a moment and think about the last time that you were fully present, fully aware, and NOT on autopilot. Routine is necessary for maximal productivity and success—especially at work. But your life shouldn’t be all autopilot, all the time. In fact, this can quite easily steal away your enjoyment while you’re trying to bask in the fruits of your hard labor. Don’t believe me? Have you ever been spending time with your family on a beautiful day and not been able to shut off the work brain? Or perhaps you’ve been on vacation with old friends, and you impulsively check your email every five seconds. Whatever it is, mindfulness can truly help you tap into these important moments and be present. What is mindfulness meditation anyway? If you haven’t been exposed to the concept or the buzz surrounding it, you might be a little confused as to what it is and how to practice it. Holistic Wellness speaker, Debra Lafler, distinguished between “mindfulness” and “meditation,” pointing out that mindfulness is merely paying attention, being aware, and observing the present moment in a non-judgmental way—meditation is simply a tool to increase mindfulness. Meditation practice sometimes includes maintaining awareness of the breath, the body, and allowing thoughts to pass through the brain while greeting them positively. Lafler explained that the brain is like a cage of screaming animals because our mind is constantly thinking. She encourages people to practice meditation as a way of observing this phenomenon, because doing so can reduce the amount of time negative feelings or emotions can dictate your mood and mental wellbeing. You don’t have to commit to joining a group right away or attending a class. In fact, you can give it a quick try right here. There are also fantastic apps for learning and trying mindfulness out. Headspace is a more instructional and comprehensive app and is subscription-based, while I prefer Insight Timer—which simply has various guided/un-guided meditations which you can sort through by category or time length.